In the world of wizards you sometimes have to be careful about what you try to eat when it comes to sweets. Bertie Bott's Every Flavour Beans can be made up of cherry or orange, but, as Albus Dumbledore found out the hard way, they can also come in vomit and earwax. Yuck! Fortunately the slugs are a bit tamer. They come in pear, sour cherry, watermelon, tangerine, and, most ironically, banana. I mean, did the makers take into account that there really is something called a banana slug? 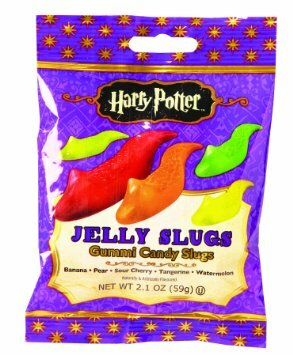 To surprise your favorite kid, or yourself, with Harry Potter Jelly Slugs, click here.